In the summer of 1929, most people believed that the stock market would continue to rise forever. Wall Street was enjoying a eight-year winning run that had seen the Dow Jones increase 500 per cent from the start of the decade – an unprecedented rise. The Dow peaked at 381 on 3rd September and later that day the most respected economist of the era, Irving Fisher, declared that the rise was “permanent”. One man vigorously disagreed and started a process that would see him sell $450 million of shares short. Two weeks later, the market began falling and rising again on successive days for no apparent reason. This situation endured for a month until what became famously known as the three ‘black’ days: On Black Thursday 24th October, the Dow fell 11% at the opening bell, prompting absolute chaos. The fall was stalled when leading financiers of the day clubbed together to buy huge quantities of shares. But it was short-lived succour and, over that weekend, blanket negative newspaper commentary caused the second of the ‘black’ days on Black Monday 28th October when the market dropped another 13%. The third ‘black’ day, Black Tuesday 29th October, saw the market drop a further 12%. When the dust had settled, in the aftermath of the 24th to the 29th October, Wall Street had lost $30 billion. 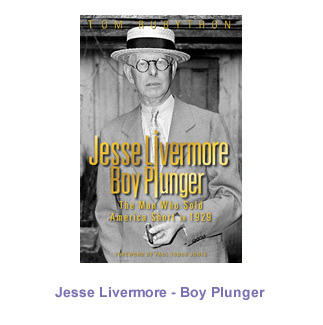 Only much later did it become known that the man who had sold $450 million of shares was Jesse Livermore. Livermore made nearly $100 million and overnight became one of the richest men in the world. It remains, adjusted for inflation, the most money ever made by any individual in a period of seven days. This is the story of that man. Tom Rubython: Tom Rubython is best known as the author of Life of Senna, the definitive biography of Brazilian race driver Ayrton Senna. Life of Senna has become the biggest-selling third party biography of a racing driver, with 150,000 copies sold. Ten years after its publication, it still sells over 8,000 copies a year. Before beginning as a biographer, Rubython was well known in the world of magazine publishing, spanning the worlds of sport and business. Aside from his work in Formula One, he has been a specialist business writer for thirty years. In business, he is the former editor of BusinessAge, EuroBusiness and Spectator Business. In sport, he has edited F1 Magazine, BusinessF1 and SportsPro. Rubython now specialises in non-fiction storytelling and has written biographies of seventies racing driver, James Hunt and the British actor, Richard Burton. He is passionate and methodical about the process of researching and writing the definitive biography. Starting out with a determination to tell the full story of a person’s life, he emphasises what is important and de-emphasises what is not; the crucial tools of any biographer.